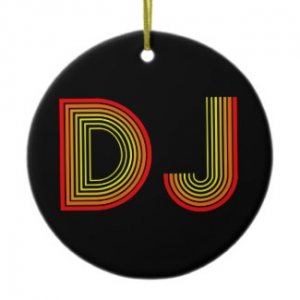 Here are 16 ideas for DJ stocking fillers. Best be quick to order in time for Christmas! 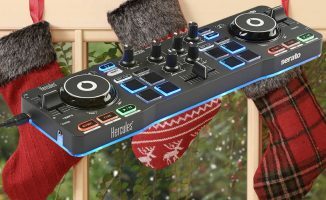 There’s just enough time to get those last-minute gifts ordered for Christmas, and so we thought we’d line up some of the best little stocking fillers for DJs this year. If you want to treat yourself to something unusual or special, now’s the time! Or if you want to drop heavy hints to your friends and family, you could just leave this article open on their computer screen, scrolled down to the gift that interests you. Then again you might be trying to buy for a DJ who has everything. Whatever, there’s bound to be something of interest in this lot. Happy shopping! 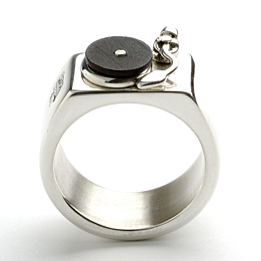 This ring might make a great gift for the hip hop DJ in your life. How’s this for a bling-tastic Christmas gift idea? It’s a turntable ring which features real vinyl and a moving tone arm. 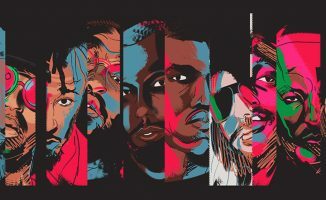 “Inspired by urban lifestyle and hip-hop culture, Sydney silversmith Nathan Thomas has created a range for music lovers and DJs alike,” says the merchant. Better be quick, though – they’ve only got only one men’s size U left. Luckily, they’ve got other equally interesting DJ jewellery too. Find out more at the Oye Modern website. Fancy a portable, battery-powered turntable? Try this. Have you got rid of your turntables, but still got a box or two of vinyl you’re keeping for sentimental reasons? Or do you just want a portable turntable you can take to junk shops to listen through boxes of dusty old 45s looking for those rare groove gems? 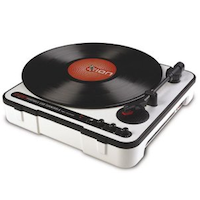 Either way, this battery powered turntable with built-in speaker would do the trick. You can even use it to rip vinyl, as it has a USB socket, though I wouldn’t vouch for the quality you’ll get from it for that purpose. See it at Amazon.com . 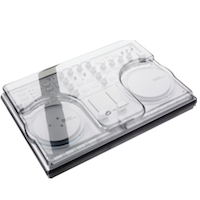 Protect your Midi controller with a tough, see-through Decksaver cover. Here’s a great idea from a forward-thinking British company. It’s all very well having a portable DJ controller, but it’s still got knobs, fasders and buttons sticking out and they could easily get bent or worse in a gig bag. But what’s the point of having a portable controller if you them flightcase it, making it heavy and hard to move around? A good middle ground is a Decksaver cover. Available to suit all types of DJ equipment, these tough, good-looking moulded plastic covers are a great addition to a DJ controller purchase. See the range at Juno.co.uk. Keep your cans safe with a stylish, dedicated headphones bag. Most DJs get through headphones at a right old speed, especially those who gig out a lot. The just seem to break every 6 months, no matter how cheap or expensive they are. 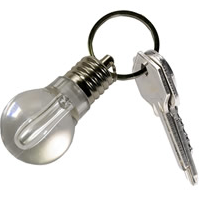 Here’s neat little gift that might just mean they get a longer lifespan. 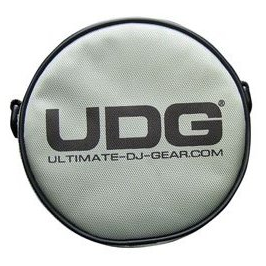 It’s a dedicated DJ headphone bag from UDG. Available in black or grey/silver, it’s the perfect way to protect your cans between gigs, in transit, or just when they’re not being used at home. See it at: Amazon.com , Amazon.co.uk . The Crane stand is highly recommended for laptop DJs. Laptop DJs are often given low tables to set up on that just scream “back ache!”. Or are asked to DJ in tiny booths where there’s no space to set up properly. In both cases, the innovative little Crane stand can help. 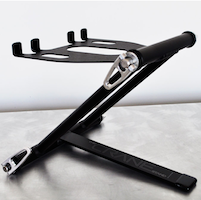 Easy to fold away and transport in the provided case, these custom-built and beautifully engineered stands can hold your DJ controller or laptop at the angle you choose, saving you the need to perch your equipment precariously, or crouch to see what’s going on on your screen. Protect your X1 controller, even during a gig. Fast becoming the controller of choice for DJs who don’t need jogwheels for their DJing style, the Kontrol X1 is all the more viable when its encased in its own lightweight, nylon but highly protective gig bag. 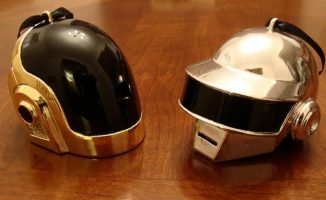 One of these can remain around your controller even when you are DJing with it. 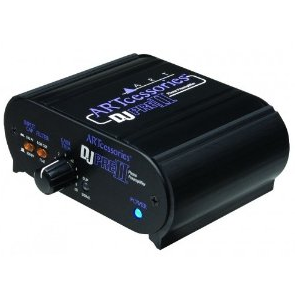 Digital DJ Tips friend DJ Domas sports two of these at his gigs, and mighty fine they look too. See it at Amazon.com . Tripods aren\’t just for cameras, you know. They\’re great for laptop DJs too. Here’s a smart idea for laptop DJs trying to fit their gear into tight DJ boxes or cramped studios. 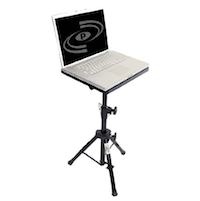 The Pyle-Pro laptop stand is adjustable in height and will allow you to put your laptop in the best possible position for DJing from. It’s well made in wood and steel, and rolls for easy transportation. With angle adjustment as well as height, there’ll be no back-twisting or eye-straining to DJ properly from your laptop once you get it set up on one of these. See it at Amazon.com . Show your mood behind the decks with one of 4 possible emoticon settings. Here’s a pretty crazy gift idea. This battery-powered emoticon DJ T-shirt has 4 possible settings which you can alter depending upon your mood. You can show a happy face, a sad face, a winking face or a surprised face. 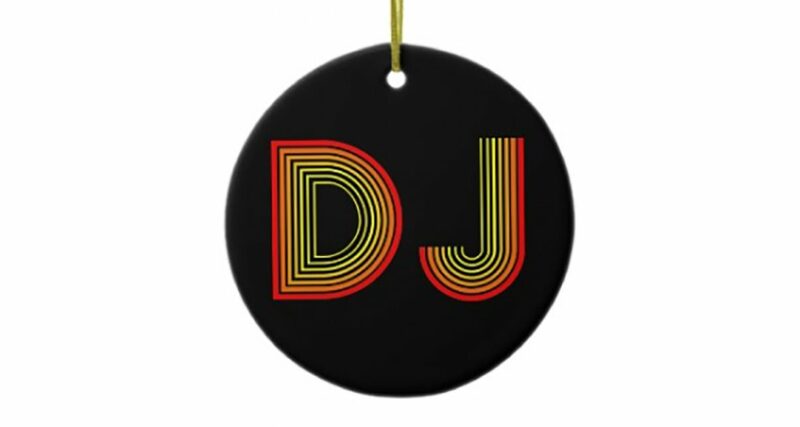 Throw in the DJ headphone design and the fact that it’s glow in the dark and you’ve got one unusual present. Needs 4 AAA batteries to work, and comes in just the one size. See it at Hard to Find Records. It\’s fun, practical and cheap… this torch is the perfect DJ stocking filler. Whether it’s to get round the back of a DJ mixer in a dark DJ booth, or to find something small you’ve hidden in the bottom of your DJ bag (whatever that might be…), or to locate that money you dropped while scrabbling about in your pocket looking for some cash to buy a drink with, having a torch on you is pretty smart for any DJ. TrueUtility have a range of LED torches that are bright, long-lasting in the batery department and fun with it – not least this torch in the shape of a lightbulb. See it at TrueUtility. 10-hour DJ sets getting your back sore? Why not invest in a DJ chair? When I used to guest DJ on Kiss FM in Manchester, England, I was amazed that the studios didn’t have chairs in – they wanted the DJs to stand up, figuring that’s how DJs do it in the clubs. Good skills, I thought. 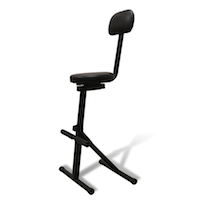 But if you’ve got a bad back, or do marathon sets, or are just, y’know, getting on a bit, you can fake it with one of these half-standing-up DJ chairs. Great for DJing dads (and grand-dads)…. Long zips and padded compartments make this a good buy. 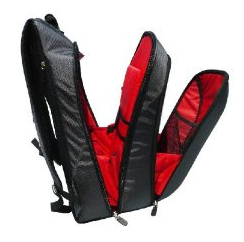 Guaranteed to fit a whole range of DJ controllers (you’ll find a full list when you click the link), this DJ backpack is designed “to provide an optimum carrying solution for a laptop mobile studio or computer DJ requiring a large control surface and using up to a 17in laptop computer”. 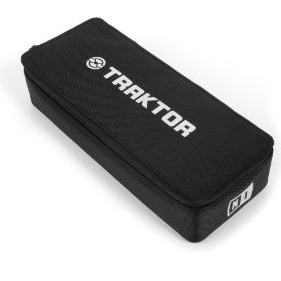 We like it because most DJ controllers are just a bit too big for normal laptop bags, but you don’t want to be carrying a flight case if you can help it… this is a good solution for the digital DJ on the move for whom space and weight matter. These mini Midi USB devices can perch in the corners of record decks or either side of the trackpad on your laptop. Each with 6 buttons marked like a dice, they’re basically Midi controllers that let you map your cue points and loops to real buttons. 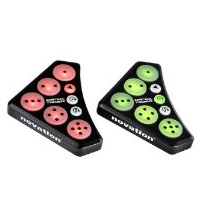 Sold in pairs, they are perfect for the DJ who likes to play with cues and loops a lot in their sets and doesn’t want to have a bulky DJ controller to do it with. If you want to fit a flexible set-up in a traditional DJ box, two of these and your laptop might just be it. See them at Amazon.com , Amazon.co.uk . Get that old vinyl safely digitised with this studio-quality device. Got a load of records that you want to digitise? There’s no point ripping your vinyl unless you do it properly, and the ART DJ Pre II Phono Preamp certainly lets you do that. This studio-quality device plugs between your record deck and your computer, giving you pristine digital audio from your vinyl. See it at Amazon.com , Amazon.co.uk . The Hyperrap DJ Scratch Watch is a bit of Christmas fun. 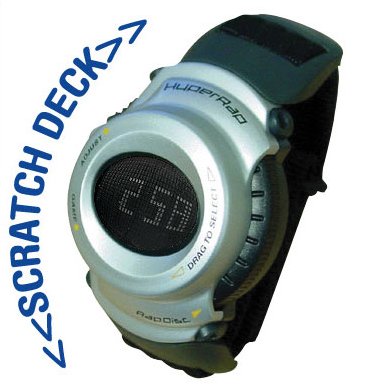 If you’re looking for a really tacky DJ gift, the Hyperrap DJ Scratch Watch could be the one. “The world’s first disc-scratching turntable wrist watch,” say the sellers – and let’s face it, probably the world’s last too. Apparently it has 2 built-in games so you can “scratch to the generated beats and watch the visual graphics change”. It’s cheap, comes in 4 colours, and may just keep you amused until Boxing Day. 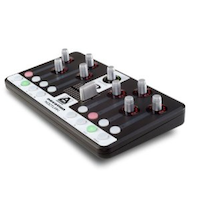 This unique little Midi controller can be put to all types of use. Regular readers will know that we think digital DJing is all about smart, small pieces of equipment that let you do new thing. This Midi controller is really very small, and alongside, say, a Novation Launchpad, would make a great hardware set-up for controlling Ableton Live. Or you could just pair it with DJ software for a mini control set-up for straight DJing – its innovative set-up means it learns any software fast. See it at Amazon.com . Get some \’Brick fever\’ into your Christmas with this little Lego dude. You have to be 5 or over according to the instructions to play with this toy, but I suspect many a DJ would be happy to have one of these purched on his controller at any age. 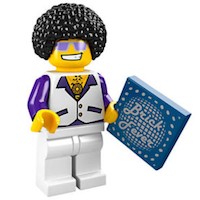 This little disco dude comes complete with accessories, which seem to include a copy of that hard-to-find disco classic “Brick Fever”. The perfect little gift for any disco-loving DJ. What’s not to like? See him at Click 4 Bricks. 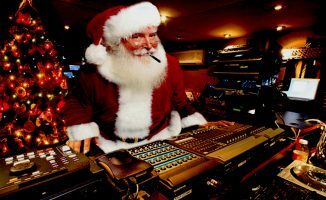 So there you have it – a few suggestions for Christmas gifts from the Digital DJ Tips team. What are you hoping for in your Christmas stocking? We’d love you to let us know in the comments below. Also… pick a vinyl sticker design for your favorite DJ’s laptop if they’ve got a Macbook at http://www.etsy.com/search_results.php?search_query=macbook+vinyl&search_type=handmade … Tons of great designs! I definitely need to check out the Namba Gear Laptop Backpack. I’ve been having the hardest time finding something that says it will fit the Numark Mixtrack. We’ve got a Crane Stand here, they’re such beautifully made things. Not cheap, but well worth the money. What about Beatport vouchers? What DJ can ever honestly say he/she doesn’t have enough music? To StrangeMatter: May be mistaken, but I don’t think you can buy BeatPort vouchers online.